During the Gallic Wars, Caesar attempted to attack the Belgae, the 'Bravest of the Gauls'. The gray skies of winter still shrouded the town of Vesontio on the Dubis River. To the south, when not obscured by mist and rain, rose the Jura Mountains, and beyond that the lofty peaks of the Alps and the nearest Roman Province, Gallia Cisalpina. It was early in the year 57 bc, and within Vesontio and the nearby villages of east central Gaul were billeted the legions of Gaius Julius Caesar. In the previous year, Caesar, Proconsul of Gallia Cisalpina and Illyricum (on the Balkan Peninsula) came to the aid of the local Gallic tribes that had suffered under the rule of German Prince Ariovistus and the inroads of the Helvetii from Switzerland. Caesar vanquished both invaders and in their stead established Roman hegemony over the area. To many Gauls, Caesar appeared as an invincible savior … but not to the Belgae! One of the three large tribal groups of Gaul, the Belgae dwelt in the northeast along the North Sea coast and west of the Rhine. They consisted of German tribes that had overrun the older Celtic population but in many ways had adopted Celtic culture. Far removed from the borders of Rome, the Belgae were little tainted by civilization. They retained their ancient monarchies and were predominantly a rural people in contrast to the more urbanized Gallic tribes bordering the Roman provinces. The Belgae took great pride in the fact that half a century earlier they alone had managed to keep the powerful Germanic Cimbri and Teutones from ravaging their lands. Belgic tribes also held sway over southeast Briton. Continually at war with their German kinsmen to the east, their valor was of great renown. They won even Caesar’s admiration. He called them the bravest of the Gauls. The Belgae did not appreciate Caesar’s meddling in affairs south of their lands. They believed that Rome would not stop until all of Gaul was hers, and as it turned out their fears were not unwarranted. Councils were held and hostages exchanged. The kings and chiefs of the Belgae readied their people for war. Before long, rumors of the Belgae’s activities reached the ears of Legate Titus Labienus, the Roman commander in charge at Vesontio and Caesar’s most able general. Labienus conveyed the news to Caesar, who currently was attending to his duties as Proconsul in Gallia Cisalpina. Caesar must have been delighted by Labienus’s messages. His opportunistic mind had seen that Gaul, beset by external enemies and internal strife, was ripe for conquest. This promised wealth and martial fame would advance Caesar’s political standing in Rome. If the Belgae conspired against him, then all the better; it would give him a legitimate excuse to make war on them. Once the Belgae were subdued, Gaul’s border with Germania would be secured. Then Caesar could safely turn his armies west to conquer the remaining tribes of Gaul. For the coming campaign, Caesar enrolled two more legions in Gallia Cisalpina: the Thirteenth and Fourteenth. In the spring they were sent to join his other six legions at Vesontio. Caesar arrived later, when the fresh grass had grown up to supply forage for his campaign. Caesar’s return was no doubt welcomed by the troops. Tall, gaunt, and physically fit, the stylish 43-year-old Julius Caesar provided a charismatic figurehead. He cared for his men dearly and always addressed them as his “comrades,” instead of his ”soldiers.” In battle he had proven to be a shrewd commander who could inspire the troops with his personal courage. It was Caesar, not the state, to whom the legionaries had made their oath of loyalty and it was Caesar to whom they looked for pay, booty, and provisions after demobilization. Caesar’s army was an imposing force. Alongside his eight legions, each fielding over 4,000 men, it included auxiliary Numidian light infantry, Cretan archers, and Balearic slingers for a grand total of around 40,000 combatants. His cavalry—4,000 strong—was made up mostly of allied Gauls who had dispersed to their homelands during the winter but now reassembled to rejoin the Romans. There were also smaller permanent Gallic, Spanish, and “bodyguard” German cavalry detachments. Following the soldiers were thousands, if not tens of thousands, of camp attendants. From Vesontio Caesar instructed allied Gallic tribes along the Belgic border to inform him about the happenings among the Belgae. When they confirmed Labienus’s reports, Caesar secured his wheat supply and marched his army toward the Matrona River (the Marne). A fortnight later he arrived at the Belgae frontier. At first the Belgae’s repute for bravery seemed unfounded. So rapid was Caesar’s approach that the nearest tribe, the Remi, was taken off guard. They quickly surrendered to the Romans and all but groveled at Caesar’s feet. The Remi pleaded that they had no wish to make war on Rome and they were ready to give hostages. Their towns stood open to the Romans and they would obey Caesar’s commands and supply his army with grain. As for the rest of the Belgae, the Remi told Caesar, they were up in arms! King Galba led a mighty alliance of his Suessiones, the powerful Nervi, and Bellovaci, and a host of lesser tribal contingents as well as German mercenaries from across the Rhine. The exact number of Belgic troops at Galba’s disposal can only be guessed at. On previous occasions the Roman army had faced invasions of barbarians that came as whole tribes, with their families and belongings. These barbarian armies were forced to pillage the land for supplies. In contrast, the Belgae were fighting on home ground. Unburdened by civilians and with short supply lines, they would have been able to maintain an army of unusual size. Caesar tells us the various tribes promised to muster some 306,000 warriors to fight for Galba. This is certainly an exaggeration, but Galba’s army could well have been over 75,000 warriors strong, still twice the size of Caesar’s fighting strength. If Galba could force Caesar into an open battle, the Romans might be swept away like leaves in the wind. Caesar knew this and convinced Diviciacus, the pro-Roman chief of the Aedui, his staunchest Gallic ally, to come to his aid and ravage the lands of the Bellovaci to the west. Such a two-pronged offensive, it was hoped, would force the Belgae to split their forces. But it took time for Diviciacus to gather his army and arrive at the scene. In the meantime Caesar found himself alone against the awesome might of Galba’s army, which was rapidly approaching the borders of the Remi. Caesar crossed the Axona River (the Aisne) by means of a bridge and went on the defensive. He built a fortified camp on a hill with his back close to the river. To the front, the hill formed a slight ridge and then sloped down gently to a brook (La Miette) that meandered through a swamp. The slopes on the right and left sides were steeper. To ensure the safety of the Roman supply line across the Axona, Caesar protected the bridge by means of another redoubt on the south bank, held by six cohorts under Quintus Titurius Sabinus. Sabinus’s stronghold boasted 12-foot ramparts and an 18-foot-wide ditch. Eight miles distant, Galba placed Bibrax, a town of the turncoat Remi, under siege. The hapless citizens cried to Caesar for aid. In answer he sent some of his auxiliary troops, who crept into the town at night to reinforce the defenders. Infuriated, the Belgae left the town and set aflame every Remi village and farmstead in their path as they marched off to meet the Romans. Less than two miles from Caesar, they set up their camp on the north bank of La Miette. The smoke and watch fires of the Belgae camp extended for more than eight miles. Owing to the enemy’s great numbers, Caesar continued to avoid a direct confrontation between his legions and the Belgae. Instead he sent his cavalry to keep the enemy occupied. Galba seemed equally reluctant to cross the swamp and likewise only sent his cavalry to skirmish with the Romans. When the fortifications were completed, Caesar left the newly enrolled Thirteenth and Fourteenth legions to hold the main camp and drew up his remaining six legions along the swampy shore of La Miette. His actions roused the Belgae who assembled to face the Romans across the swamp. 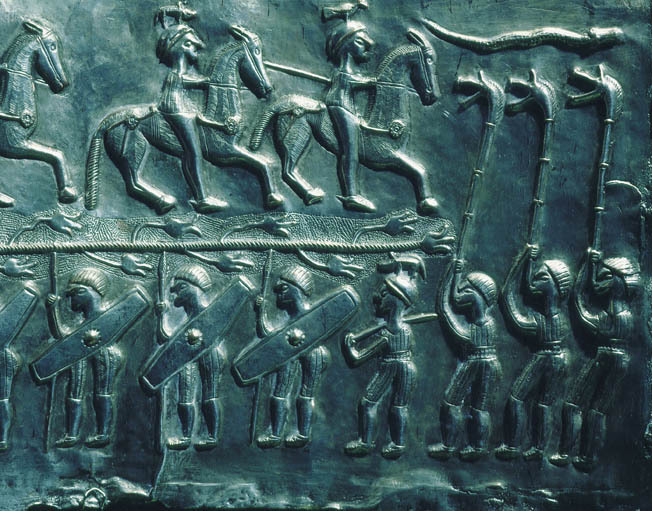 It is difficult to say whether the Belgae warriors’ arms and armor more closely resembled those of their German kinsmen or those of their Celtic Gaul neighbors. Certainly compared to the Romans the Belgae were a motley lot. Their oblong oval or hexagonal infantry shields and their round cavalry shields were probably brightly painted with animal and geometric designs. For many, their shield would have been their only defense. Others would have had iron helmets, perhaps plumed and with cheek guards, while chiefs and distinguished warriors sported corselets of mail. The most common weapons were spears, long swords, javelins, and possibly bows and slings. The cavalry of both sides splashed across the swamp in wild but indecisive charges and countercharges that tended to favor the Romans. Caesar probably hoped that the presence of the legions would entice the barbarians to attack. However, Galba had been unwilling to cross the swamp with only the Roman cavalry facing him. He certainly wasn’t going to cross with the Roman legions on the other side, ready to hack down his warriors as they made their way through the swamp. Outflanking the legions was out of the question owing to Caesar’s new forts and ditches. When no barbarian attack materialized by the end of the day, Caesar withdrew his legions back to his camp. During the night, the Belgae decided to make their way across the swamp. No Romans stood guard on the opposite bank and the Belgae skirted the Roman fortifications to head south for the Axona. The Roman ramparts and towers were faintly silhouetted against the night sky, but in the dark the Belgae remained undetected. They had no hope of taking Caesar’s main camp. Instead a troop of bold Belgae attempted to cross the Axona, hoping to storm Sabinus’s redoubt on the south bank of the river and destroy the bridge. If successful, the Roman supply line to allied tribes would be severed. And even if they failed, the Belgae would still remain in a position to devastate the surrounding Remi lands and deprive Caesar of a nearby source of supplies. However, the vigilant Sabinus spied the barbarians fording the Axona. He at once sent word to Caesar who hurried to his aid across the bridge with the Numidians, slingers, archers, and cavalry. Seeing that they had only a few cohorts, Caesar’s light troops, and cavalry to deal with, the Belgae continued to wade through the shallows of the river. But they were met by a storm of stones and arrows, perishing in droves till their corpses choked the river. Over the bodies of their fallen comrades others strove to gain the far side only to be chopped down by the Roman cavalry. After the attack petered out, the Belgae found themselves in a dilemma. The Romans refused to fight them on favorable ground and their own grain reserves were running low. Although the homelands of the individual tribes were relatively close, the barbarians simply lacked the infrastructure and organization to supply their army. A council was held and it was decided that the tribes would return to their lands. The recent news of Diviciacus’s Aedui approaching the Bellovaci homelands provided further impetus to break up the Belgic army. If the Romans attacked any tribe, the other tribes promised to come to its aid. This proved to be little more than a face-saving gesture. Some time before midnight, with much uproar and commotion, disorganized groups of disgruntled Belgae departed for their homes. Their retreat was forthwith reported to Caesar by his scouts, but Caesar could not believe his good fortune. He remained skeptical and feared an ambush. Not until dawn, when further reconnaissance confirmed the truth, did Caesar send his cavalry, followed by Titus Labienus and three legions, to harry the rear columns of Belgae. The pursuit went on until sunset, over many miles. Isolated throngs of Belgae fought to the last man but were surrounded piecemeal and annihilated. The campaign now began to resemble more of a Roman triumphal march than a war. At the town of Noviodunum, the Suessiones were overawed by the array of Roman siege engines. They surrendered and offered the sons of King Galba as hostages. In the territory of the Bellovaci, Caesar had not even reached Bratuspantium before the town elders came out to submit to the Romans. At the town, the women and children lined the walls, pleading for peace. Diviciacus, who had disbanded his Aedui army and joined Caesar, supported their supplication. 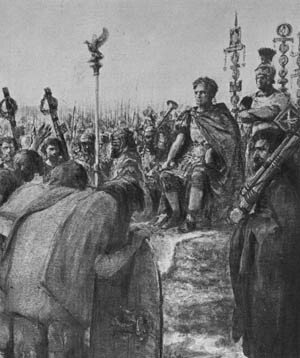 Caesar agreed, but to ensure that the powerful Bellovaci remained peaceful, confiscated their weapons and took 600 hostages. After the Bellovaci, the Ambiani surrendered unconditionally. But in the lands of the Nervii the picture changed. Fiercely proud of their native ways, the Nervii scorned all trade with the civilizations of the south. They even forbade the import of wine, which they thought lessened their courage. Disgusted by the cowardice of their Belgae kinsmen, the Nervii were determined to cast out the Roman invaders. Along with their like-minded neighbors, the Atrebates and Viromandui, the Nervii awaited the Romans on the south side of the Sabis (the Sambre) river valley. Furthermore, the Aduactuci, descendants from a splinter group of Teutones and Cimbri who had settled in the area, were coming to their aid. Some of the Belgae hostages managed to sneak away from their Roman captors at night. They visited the Nervii and told them that the Roman army was vulnerable if attacked on the march. At such time, the legions were strung out, not in their battle formations, and separated from each other by each legion’s baggage train. Their only protection was the relatively small screening Roman cavalry. The Roman legions on the march were therefore dangerously exposed to large cavalry attacks or ambushes. Unfortunately for the Nervii, they spurned the use of cavalry and had only the horsemen of their allies to rely on. However, the Nervii excelled in concealing themselves within woods and thickets; thus they decided to prepare an ambush. For three days Caesar pressed deeper and deeper into Nervii territory. It was at this point that prisoners told him of the Nervii army awaiting him on the far side of the Sabis, little more than 10 miles from his present camp. In light of the closeness of the enemy, Caesar changed his regular marching order. Instead of each legion being followed by its baggage train, he advanced with six legions in “field order” and placed the entire baggage in the rear, followed by a guard of the Thirteenth and Fourteenth legions. Reconnaissance units were sent ahead to choose a suitable campsite on the north side of the Sabis. The shallow but broad Sabis was flanked with slopes on both sides. The northern slope was fairly open, with sparse tree growth but uneven ground. Toward the south, 300 yards of open terrain sloped up to dense woodlands and thickets. A number of enemy cavalry held the open ground near the river. Caesar unleashed his cavalry along with the slingers and archers, who splashed across the stream and drove the Belgae horsemen back into the woods. The Roman cavalry did not follow into the depth of the forest, so the Belgae cavalry was able to reassemble and charge again. The Roman horsemen and a barrage of missile fire once more held them at bay. Caesar seemed confident that his cavalry, slingers, and archers sufficed as protection for his legions. The Roman host then tramped down the valley side and was soon busy cutting down timber and shoveling earth to erect the usual camp entrenchment. The presence of the Belgae cavalry should have forewarned Caesar that the entire Nervii coalition might be nearby, just as the prisoners had told him. Despite such knowledge Caesar considered his cavalry sufficient cover for his toiling legionaries. After all, other than some cavalry units, the enemy seemed nowhere close by. He was wrong. From beneath the emerald foliage of the woods on the far bank, the eyes of some 30,000 Nervii, Atrebates, and Viromandui watched the oblivious Romans with glee. As soon as the Roman baggage train appeared over the hillside, the entire Belgae army broke out of the woods. The Nervii formed the left wing, the Atrebates the right, and the Viromandui the center. The barbarians poured down the hillside like a human avalanche, unstoppable in its fury. 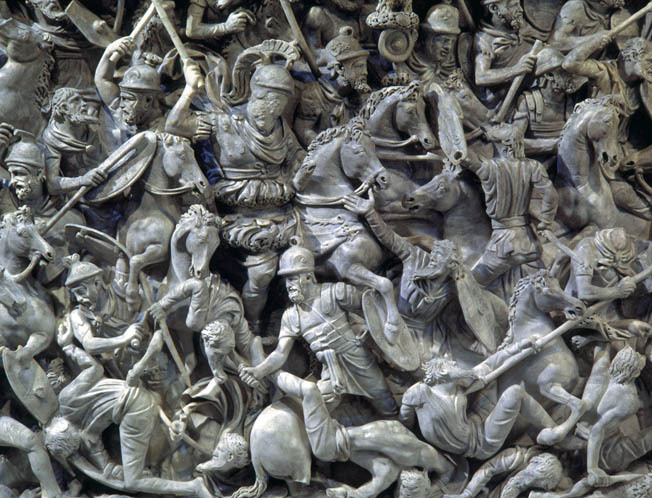 The Roman cavalry and light troops were completely overwhelmed and scattered, barely even impeding the enemy charge. So fast were the barbarians that Caesar wrote, “Almost at the same moment they were seen at the woods, in the river, and then at close quarters!” The three-foot-deep river proved scarcely more of an obstacle than the Roman cavalry. In no time the barbarians gained the river’s farther side to continue with seemingly unbroken momentum up to the entrenching Romans. The barbarian ambush would have sealed the doom of almost any other army caught in the same situation. But this was not just any army; it was a force of the Roman legions at their prime, under the generalship of one of the great captains of history. The <em>vexillum</em>, the red flag of battle, rose high, accompanied by the drone of trumpets. Everywhere the men threw down their tools and rushed to the call of battle. Wisely, Caesar had ordered his generals to remain with their respective troops during the entrenching. Without waiting for Caesar’s orders they at once assembled their men as best they could. 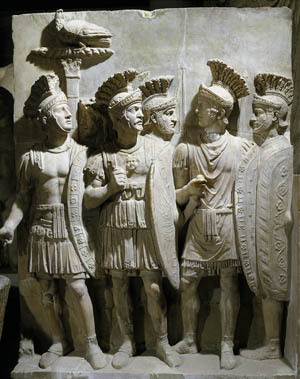 The legionaries, many half-armed or donning helmet or shield while on the run, hastened to whatever standard was nearest whether it was their own unit or not. Caesar was everywhere, first at the Tenth Legion, then at the others. He bellowed out orders, and with words of valor encouraged the men to withstand the assault of the enemy. There was no time to draw up the regular tactical formations, so separate clumps of legionaries formed a rough line against which burst the barbarian tide. The Ninth and Tenth legions, under Legate Titus Labienus, formed the left wing of the Roman army. The <em>optiones</em> (the centurions’ aides, struck unruly legionaries with their staves to keep order and silence in the ranks, while closer and closer rushed the howling Atrebates warriors. Only when the barbarians closed within 30 yards did the circular bronze <em>cornu</em> horn drone across the Roman lines, the signal for the legionaries to let loose a murderous volley of javelins. 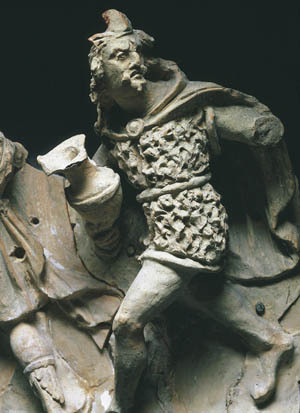 The 7-foot <em>pilum</em>, with its entire weight concentrated behind a small triangular point, easily penetrated the wooden shield of the barbarian, and could reach the man behind. These hurled <em>pila</em> broke the Atrebates’ momentum. With a yell the legionaries drew their swords and countercharged. Breathless and wounded, the Atrebates were pushed back downhill into the river. There the Romans exacted a toll so heavy that the waters turned crimson. On the far bank, the Atrebates rallied and desperately tried to throw the Romans back, but to no avail. The men of the Ninth and Tenth legions carried the assault up the bank and routed the Atrebates up the hill. Likewise in the center, the Eleventh and Eighth legions withstood and broke the initial onslaught of the Viromandui. They, too, carried the fight downhill to engage the Viromandui on the river’s bank. This proved to be a serious error for it opened a huge gap between the Eighth and the Twelfth legions. The Twelfth, along with the Seventh, had remained up slope to the right. Into the gap poured the bulk of the Nervii led by Boduognatus, their commander in chief, right toward the Roman camp and baggage. At the same time other Nervii warriors ran to envelop the Twelfth and Seventh legions. Milling around the camp were the remnants of the routed Roman cavalry and the Roman auxiliary light troops. At the sight of the oncoming Nervii they fled in wild panic. Their fear spread among the Roman camp followers, some of whom were prematurely looting the battlefield in wake of the victorious Roman left and center. Camp followers, horsemen, and slingers scattered in all directions. The auxiliary Treveri (an allied Gallic tribe) cavalry did not cease their flight until they arrived back in their homelands. There they heralded that the Romans had been overcome. On the Roman right wing the situation looked dire indeed. The men of the Twelfth Legion huddled around their standards. Attacked from both the front and flanks, the legionaries were so closely jammed together that they hampered each other while they vainly tried to fend off the assailing Nervii. Behind their laterally curved, oval shields, the legionaries exposed as little of their bodies as possible to the enemy. A horsehair crested helmet, with cheek and neck guards, protected their heads and, for some, mail hauberks their torsos. Yet their armor was not invulnerable. The yard-long sword of the tall and powerful Belgae warrior slashed down with terrific force to cleave through the Roman helmet and into the skull beneath. All the centurions of the fourth cohort lay slain, as was the <em>signifer</em>, his bronze animal standard lost among the barbarians. The other cohorts fared little better, their centurions dead or wounded, including the chief centurion Publius Sextius Baculus of the first cohort, who no longer could stand on his own. The Nervii unrelentingly pushed uphill and against the flanks. All of the legionaries were tiring and many of those in the rear, who were mercilessly being hit by a hail of enemy missiles, retired from the battle while they still could. To the rescue came Caesar, who snatched up a shield from a soldier in the rear. He shoved his way through to the front lines, rallied the centurions by name, and cheered on the rank and file. The knowledge of his presence spread through the ranks and like a tonic instilled the men with renewed vigor. Caesar called for the lines to advance a little, to give them more space. At the same time he ordered the tribunes to close the space between the Twelfth and the Seventh legions to their right, which was also hard pressed. Slowly the two legions inched together to form a square. With his rear and flanks now protected, Caesar called for the front lines to charge. At this moment the Thirteenth and Fourteenth legions of the Roman rear guard appeared over the crest of the hill. Meanwhile, Titius Labienus had led the victorious Tenth and presumably the Ninth Legion all the way into the Belgae camp. From there he beheld the arrival of the Roman rear guard and the fierce battle raging on the Roman right wing. At once he ordered the Tenth Legion to hasten to the aid of their commander in chief. With breakneck speed the Tenth Legion ran down the hillside and across the river, the Ninth Legion likely remaining behind to occupy the enemy camp. The arrival of the Tenth Legion so revived Roman morale that even wounded legionaries heaved themselves up with their shields in a effort to rejoin the battle. So, too, the remaining Roman cavalry, in an effort to undo their earlier cowardice, returned to ride down enemy stragglers. Although Caesar’s account of the battle now becomes muddled, it is clear that the Romans surrounded the Nervii. With Caesar and the Twelfth and Seventh legions striking the Nervii left flank, the newly arrived Thirteenth and Fourteenth legions engaged the enemy from the front. The Eleventh and Eighth appeared to have remained on the river’s bank and thus on the Nervii’s right flank. Most devastating of all, the Tenth Legion charged right into the Nervii rear. Outnumbered and surrounded, their allies slain or routed, the Nervii fought on with unparalleled courage. When their front ranks lay dead, others took their place to fight upon the bodies of the fallen. Here and there, Nervii warriors stood defiant upon mounds of corpses, deflecting spears and missiles and hurling them back at the Romans below. But all their desperate fury could not save them from defeat. Caesar wrote, “The battle brought the name and nation of the Nervii almost to utter destruction.” When calm descended upon the hillside, a pitiful 500 Nervii remained alive. Deputies of the Nervii elders, who along with the women and children had sought refuge in nearby marshlands, arrived at the Roman camp and formally surrendered. Caesar proved to be a merciful victor. The Nervii were to keep their lands and settlements. Caesar also commanded their neighbors not to make war on the weakened and now-vulnerable Nervii. The battle of the Sabis proved the climax, but not the end, of the Belgae campaign of 57 bc. As will be recalled, the Aduatuci were on their way to aid the Nervii. But on hearing of the disaster on the Sabis, they retired to their homelands and prepared for the inevitable Roman invasion. The Aduatuci abandoned all their towns and gathered their entire belongings in a single, heavily fortified stronghold (either at Namur or Mont Falhize). The stronghold boasted steep cliffs on all sides except one, where a lofty double wall defended a gently sloping approach. Sharp stakes and heavy stones lined the parapet. The Aduatuci launched sorties to skirmish with the Roman army, but they had no way of stopping the Roman arrival before their gates. Caesar surrounded the Aduatuci stronghold with five miles of 12-foot-high earthworks, strengthened with redoubts. Next the Romans began to construct a siege tower some distance from the walls. This provided great amusement for the Aduatuci, who laughed at the Romans, for how would so puny and short a people as the Romans hope to move so mighty a tower! But when the tower began to roll toward the walls, the barbarians were so dumbfounded that they appeared to surrender without a fight. The gates were flung open and in exchange for Roman “protection” the Aduatuci delivered their weapons into Caesar’s hands. To prevent looting, Caesar forbade his troops to remain in the town—unaware that the Aduatuci had yet to play their last card. Drawing on a hidden stockpile of weapons, they sallied from the town some time after midnight in hopes of catching the Romans unaware. But the ramparts and towers of the Roman camp proved impregnable. Some 4,000 Aduatuci were left dead before the remainder retired to the town. In the morning the Roman battering ram crashed in the gate. The whole town was looted and the population marched into slavery. Thus ended the Belgae campaign, which further added to Caesar’s fame. Caesar had defeated all three of the most dreaded and feared warrior nations: the Helvetii, the Suebi, and the Belgae. If they could not defy the might of Rome then who could? And as if this were not enough, Caesar’s cavalry commander, Publius Crassus, during the same season brought the maritime tribes along the channel from the Seine to the Bay of Biscay under Roman dominion. The bulk of the legions now got some well-deserved rest as they went into winter quarters in central Gaul. For the Twelfth Legion and a detachment of cavalry, however, there was a more immediate battle ahead. They were dispatched to secure a trade route from Lake Geneva through the Alps, against the opposition of local hill tribes. When this last campaign had drawn to a close, Caesar left his loyal men behind and departed for Illyricum. Justifiably proud of his accomplishments for the year, his mind soon teemed with thoughts of a new adventure: the invasion of Britain! In Rome the scale of Caesar’s victories caused unprecedented jubilation among the people, much to the chagrin of Caesar’s political enemies. Merchants boasted of 53,000 Aduatuci slaves sold at auctions. Even Gnaeus Pompeius Magnus, Caesar’s partner in the all-powerful Triumvirate, along with the multimillionaire Marcus Licinius Crassus, was most impressed. Pompey sponsored an unprecedented thanksgiving of sacrifices and public feasts for 15 days in honor of Caesar—five days longer than one previously given to himself and three times longer than the usual duration. In addition the Senate awarded Caesar more funds and extended his command in Gaul for a further five years. Caesar’s star was clearly on the rise, but both in the political arena of Rome and in Gaul, storm clouds gathered. Despite Pompey’s act of goodwill, the Triumvirate would soon begin to unravel and eventually involve Caesar in the most famed civil war in Roman history. In Gaul, the conquered tribes stirred with revolt against the hated Romans, while across the Rhine lurked German tribes, ready to pounce across the river and carve out a slice of Gaul as their own. Although at the close of 57 bc Caesar considered Gaul pacified, the war was far from over. Tags Ancient Greece/Roman Empire, Celts, Cimbri, earthworks, Gaius, Gaul, German tribes, javelin, Julius Caesar, Numidian, Rhine River, roman legion, Romans, Teutones.